1.8mm Bore Diameter KFL08 Pillow Block Bearing Rhombic Flange. 2.Zinc Alloy Rhombic Flanged Base, rust-proof, durable, have long Life. 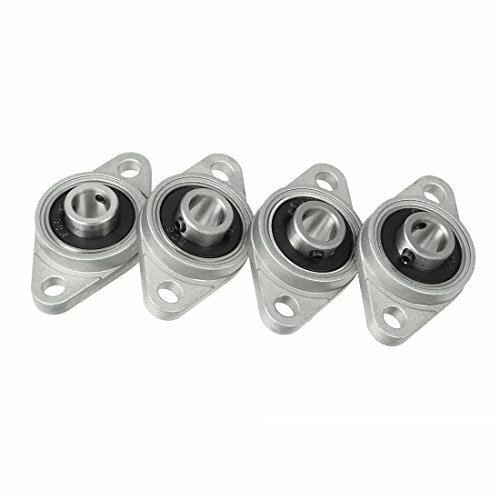 3.This Bearing is a self-aligning, pillow block bearing, you can adjust or replace the bearing easily. 4.Pillow Block Bearing Flange Block Bearing is widely used in various of machinery, especially in food machine. 5.They also can be used into machinery, convey ring systems, film processing machinery, spin machine, printing machinery. Specifications Product Name: Pillow Block Bearing Package Content: 4pcs x Pillow Block Bearing Material: Zinc Alloy, Bearing Steel Color: Gray Weight: 112g Model: KFL08 Overall Size: 48(+/-2) x 27(+/-2) x 12(+/-2)mm/1.9-inch x 1.06-inch x 0.47-inch(L*W*H) Bearing Inner Dia. : 8mm/0.31-inch Mounting Hole Diameter: 5mm/0.2-inch Mounting Hole Distance: 37mm/1.46-inch.